Any chance you could do a set (2) of the tie-downs for the M747 trailer ramps? 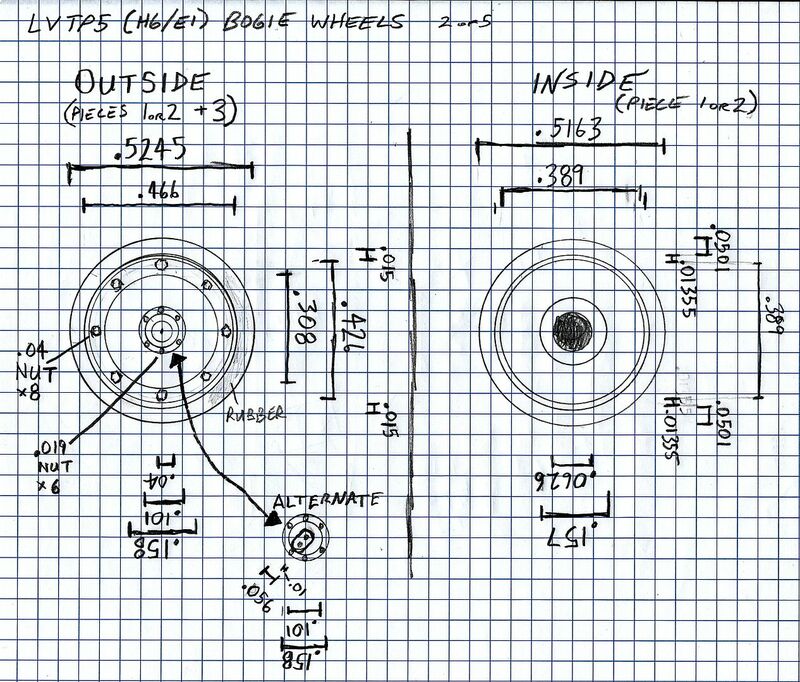 Finally finished sketching the earlier style bogie wheels for the LVTP5 (H6/E1). With the parts being only a hair over 1/2 -inch it took some time. I sketched the mounting threads on Pieces 1 and 2 with intent it allows builder to display the inner bogies without the outer rubber wheels (Piece 3). To mount Piece 3 the builder would need to snip the mounting screws. Piece 3 is sketched with mounting screw and nut but, builder can snip these if prefer to display on vehicle as a spare or in process of repairs. Piece 1 / 2 has also has a later / alternate style grease zerk mount if worth trouble of printing them as separate pieces or as additional / alternate styles of inner bogie wheels, like the real thing. 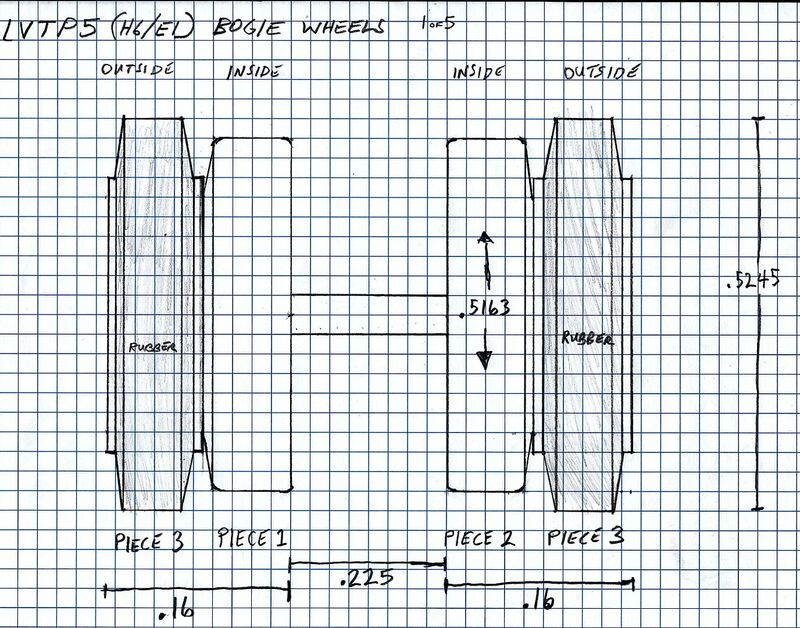 Piece 1, Piece 2 and two Piece 3’s make one set of bogie wheels. The LVTP5 (H6/E1) has 18 of these sets of bogie wheels. 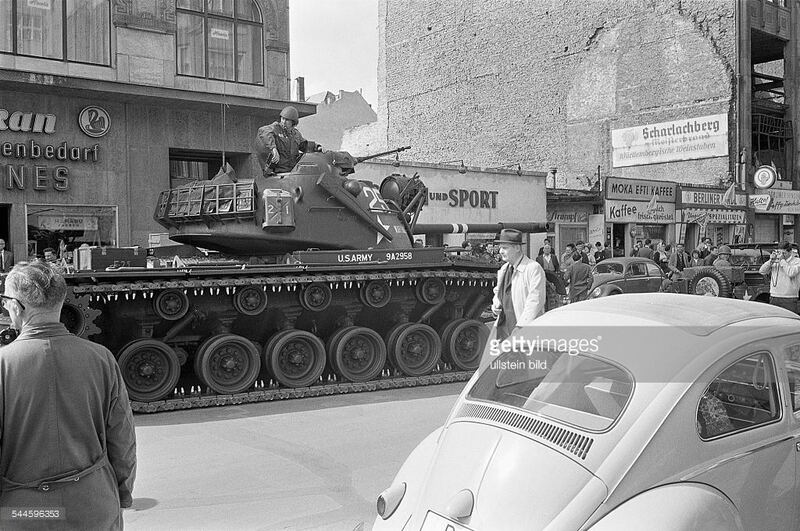 One vehicle set would require Piece 1 x18, Piece 2 x18 and Piece 3 x36. However, I think nine sets of bogie wheels would be a good option. This would allow the builder to use the kit’s bogie wheels as the inner portion (which are mostly not visible) and these as the visible outer wheels. Another option, which may be more affordable would be to offer each piece as separate sets in groups of nine. 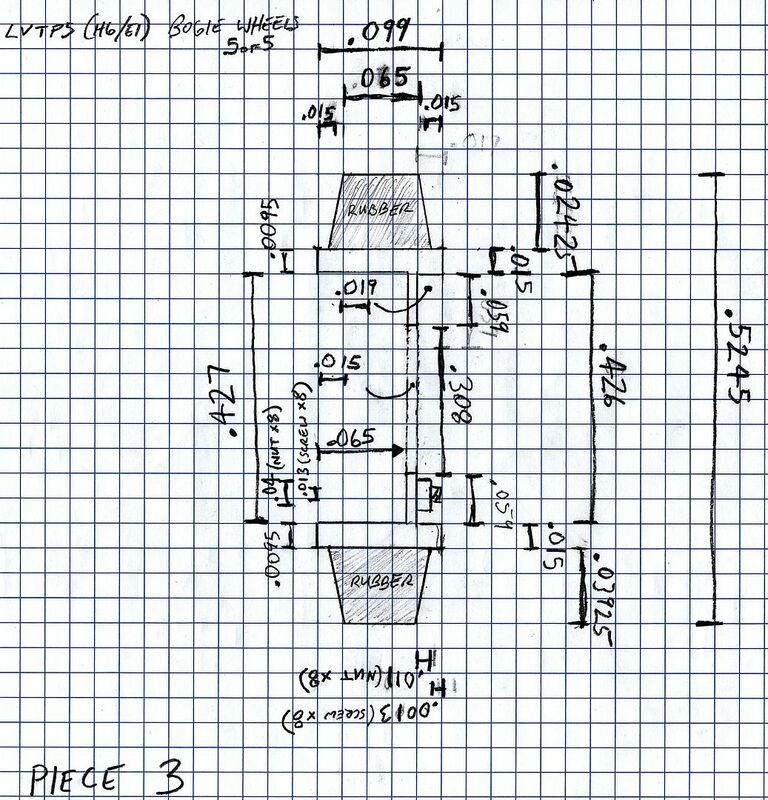 The builder could then decide what pieces and of how many they need for their LVTP5 (H6/E1) build. Sketches are not to scale as I thought I needed to exaggerate shapes/distances of the parts. All the measurements are for 1/35 scale. I’ve finally started my AFV Club 1/35 LVTP5A1. As I was assembling the suspension something just didn’t (doesn’t) look right. After pouring over piles of photographs and turning through the pages of original Technical Manuals the issue became apparent. The road wheels molded for AFV Club’s LVTP5A1 are what I’ll refer to as version “C.” The only examples I could find of that style are on some LVTP5s on display stateside and those used by ROC Marines. 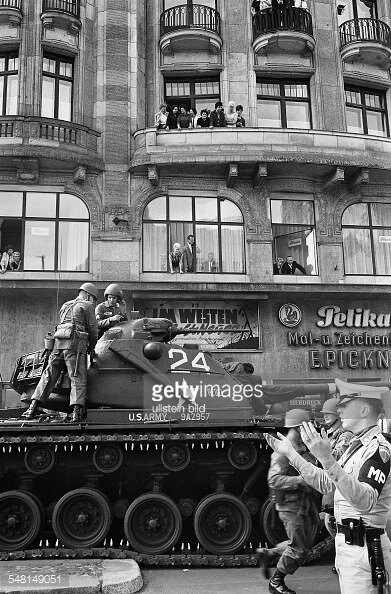 However, that style was not present on the original nor in what you’ll find in photos of vehicles in Vietnam or service of that time. The “newest” Technical Manual for the P5 variant I posses is dated 1967 so the molded roadwheels came out some time after that. The issue is that the roadwheels molded in the kit are single piece affairs whereas the earlier version were two-pieces. This allows for wide range of options if produced for 3D-printing, especially considering the announcement of two new releases this year – an LVTH6 and an LVTE1. Both are based on the LVTP5 hull and from what I’ve read will use AFV Club’s moldings. Which means the roadwheels will most likely still be incorrect for a Vietnam era USMC LVTP5/H6/E1. I have the LVTP5A1 kit as well as various Technical Manuals which would allow me to extrapolate the measurements for new/correct roadwheels. There are two other versions whose discernible difference is how the grease zerks (item #15 in image) are protected. These could be provided in a parts count ranging from nine to ninety. The small count reflects single piece prints (item #1 in image) as direct replacements for outer single pieces for one side of the vehicle. With 36 roadwheels per vehicle, there is a lot of mixing that can be done with differing versions of roadwheels which was common with the two early styles. Each wheel could also be printed as two pieces (items #8 and #9 in the image) similar to the real thing which would allow the modeler to build a vehicle with the rubber/replaceable (item #9 in image) portion of the wheel removed or have extra rubber/replacement parts mounted on or in the vehicle. It will take me several days to sketch the parts. The shaft (item #2 in the image) could be attached to a wheel as done in the LVTP5 kit or could be self sourced as it would only be a 1/16 rod cut to proper length. 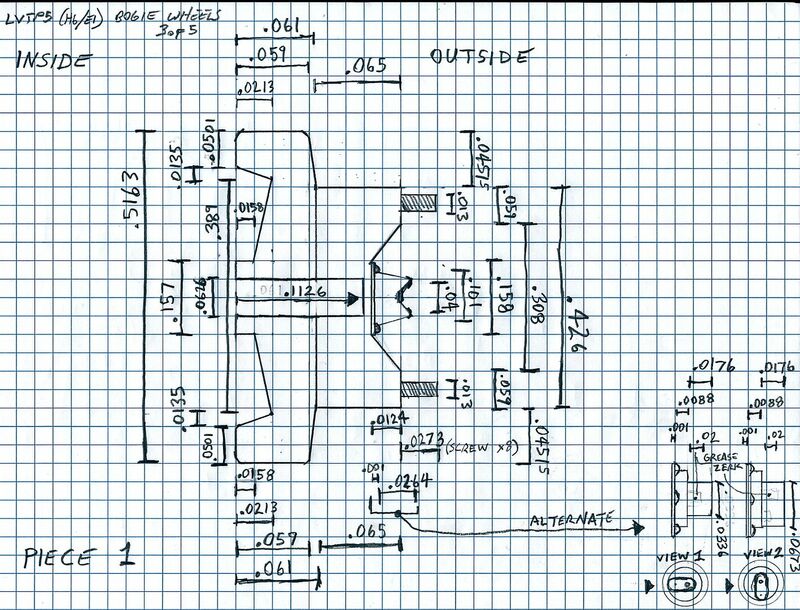 I believe this would offer modelers a superior and more accurate part for the LVTP5A1 kit as well as the soon to be released LVTH6 and LVTE1 kits. 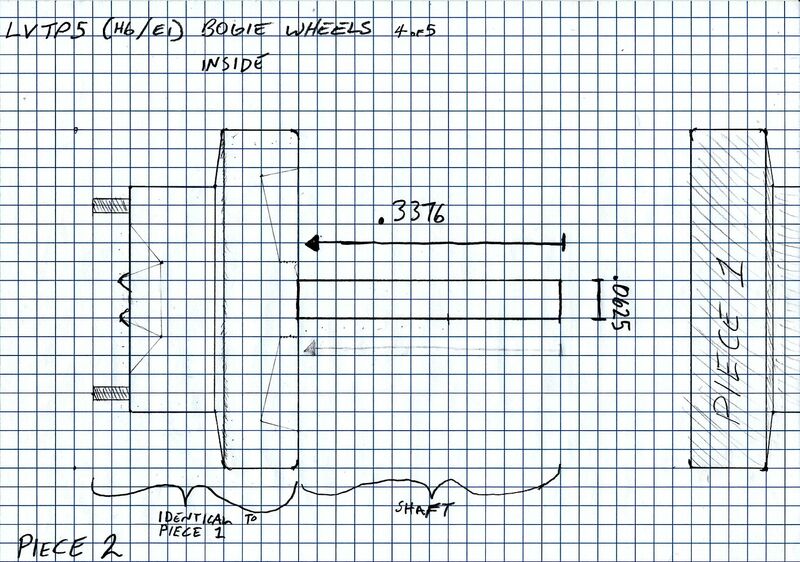 Below are scans from LVTP5 Technical Manual as well as link to which style wheels are molded in the kit. With TWO Fries Gantry Cranes coming out in plastic from two manufactures, (Takom and Amusing Hobbies) it looks like we may be in serious need of a V2 lifting fixture in the near future. Both manufacturers talk of offering lifting fixtures in their kits but based on the press releases they only mention tank engine and turret related fixtures. Hoping to generate interest in 1:72 scale either M1919 .30 cal or M73 7.72 mm MG barrels, with flash hiders, for use on the Acemodel V-100 Commando. It is a great kit and built up well, but the injected barrels were mis-matched when molded and really need replacements. Very nice, but only 1/35th - I'm into 1/16th this Century. Figured that if both scales were offered, there would be better take up. How about a suspension update for the new Tamiya Mutt kits? Both are missing a highy visible upper front wishbone part and more IIRC. Deathdork, if you look under marketplace/miniatures/vehicles/military then filter for 1/35. I then search by newest to get just the most recent adds. I've had very good luck. I guess birds and figures fall outside the range of vehicles though. I have a question. Does anyone share my opinion that the shapeways internal search engine is severely lacking? Last time I tried it did not have 1/35th or any number of the standard modeling scales as built in prompts. Birds that look like birds, animals. About all I can think of. Wonder what these Preiser birds figures really look like? The M14 storage case is finished. I just need to upload it. I made two options for it: one closed and one open (with buttstock in place) but with a tool to form PE around to make the opening cover. The cover itself would be too fragile to print. 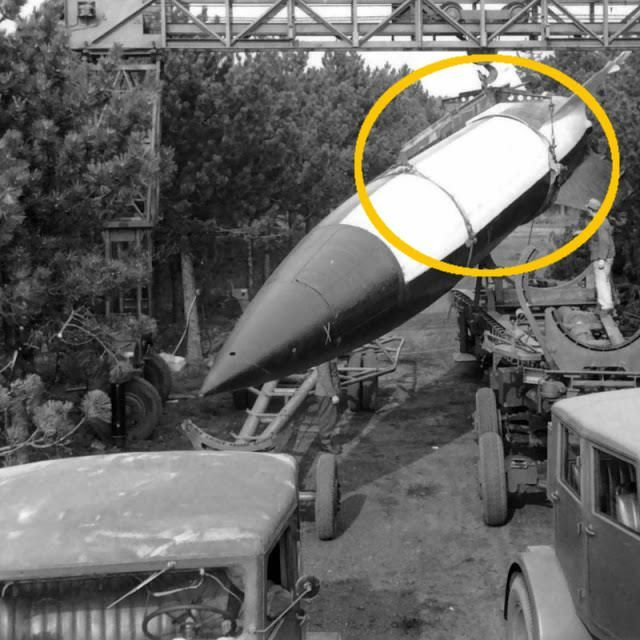 I also figured out why the QF 183mm L4 gun barrel (for the Amusing Hobby FV215B) was so expensive. I accidentally overscaled it by 2. I scaled the model down to the (hopefully) correct size and I'm updated the offering now. Now instead of being over $60 for a too large 3 piece set, it's only $15 for a single piece barrel. "Let's start off by saying sorry! We work hard to make sure you are 100% satisfied with your purchase. Unfortunately sometimes we mess up. To make sure you are completely satisfied we just placed a new order for you at no charge. Order includes: 1/35 Sniper Rifles set MSP35-088 1x 1/35 Sniper Rifles set MSP35-088 in Smoothest Fine Detail Plastic"
I'm glad to hear this is getting resolved! I can't make animals. They're too complex for me to design for now. Birds I might be able to do but they would be very simple, shape-wise. I can take a crack at those but like Bob Skipper said, Bronco makes a set of similar looking searchlights. No news. I haven't asked Mouse House yet. I can't find many good vector drawings of the gun. 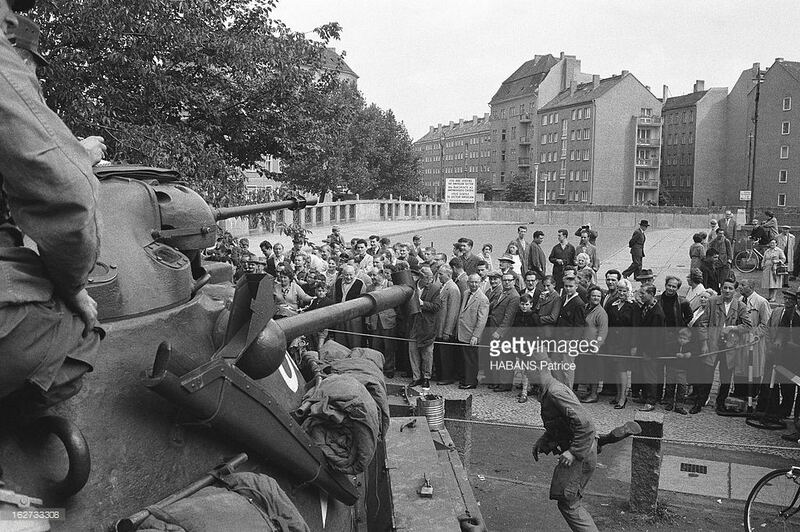 Found a few of the tank and gun but I'm not sure how accurate they are. Bronco makes a nice LED search light set. Dang, whats up with the muzzle brake on that last M48 pic?! Good idea on the gun case. I think that you're the only person who has ordered the set so far. Actually, after you ordered it, I think I had to update the model because I forgot to attach the TAC-50 to the base containing the rest of the rifles. That might be the model you bought. That set still included all four, it's just that the TAC-50 was a separate part. 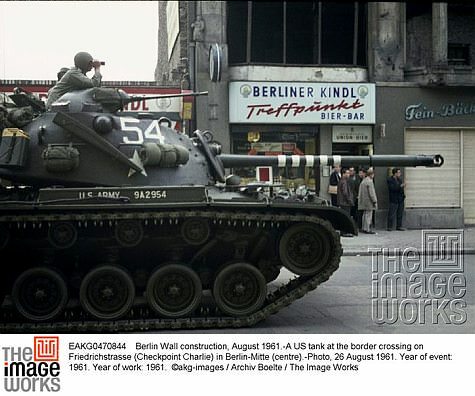 How about the M14 rifle storage case mounted on the right side of the turret of the Berlin Crisis deployed M48A1s? 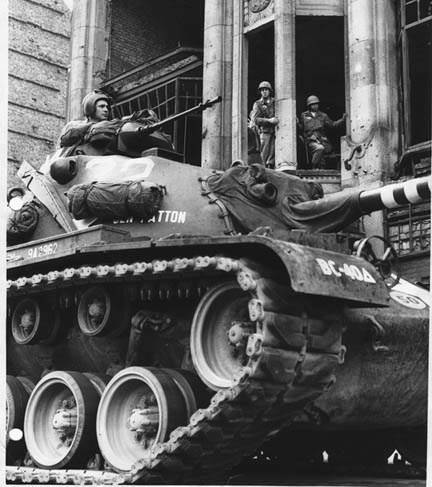 No one has tackled this yet and it is a super important detail on those M48A1s. The length of the storage case should be just a tad over the length of the M14 rifle....44.3 inches (1126mm). 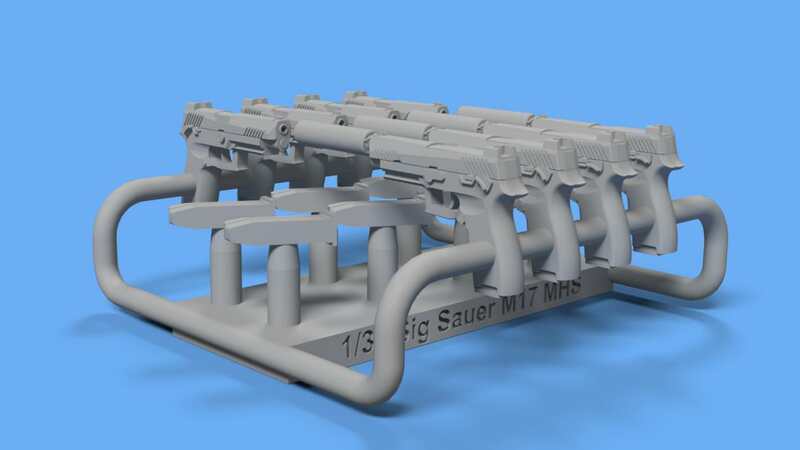 Soon to be available: 2 set of 1/35 Sig Sauer M17 MHS pistols. I will also make sets with the slide back and, if possible, in a Safariland holster. The holstered model would take quite a lot of time though. I agree with Tom. I actually can't do anything about the missing parts because the file I uploaded contains the whole model.